John Simeonidis Jr., cofounder and chief design officer of the New York-based organic burger chain Bareburger, has a dream job that keeps him on the run. Simeonidis is very hands-on when it comes to the look and feel of Bareburger’s 40 locations around the world. The business, which he launched with partner Euripides Pelekanos in 2009, is constantly evolving its environmentally conscious look to match the local and organic menu offerings and stay ahead of the competition. Simeonidis strives to have everything made locally, ideally by artisans and small vendors. All the wooden tables, chairs, stools, countertops, and millwork pieces are made in the United States from reclaimed and FSC wood by small vendors such as Ohio-based Unique Custom Furniture LTD, which he’s worked with for seven years. Any art pieces or location displays are either salvaged or made by local artists. This sustainable philosophy was borne out of need with the first Bareburger location. Artfully made bear heads can also be found in every single restaurant, including all of its restaurants overseas. Simeonidis found a Texas-based artist, Jennifer Khoshbin, who wraps papier-mâché faces of bears in various patterns and colored papers. These pieces have become an unofficial seal to every project Simeonidis has completed. The best thing about using local artisans, he says, is that no two works are ever the same. There’s a degree of unpredictability he likes both personally and professionally, because sustainability is now a staple in hospitality design. New Bareburger locations use LED lightbulbs in all lighting fixtures. Reclaimed barn boards, once part of every wall, can now be found as part of the wainscoting and bar area. 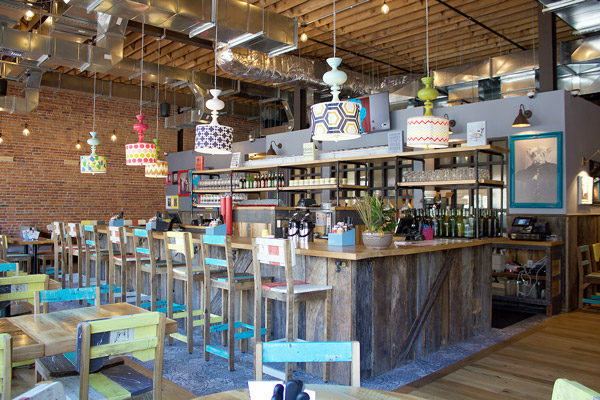 Since Bareburger first opened, however, that look comes at a greater cost, with prices for décor and building materials tripling in some cases. 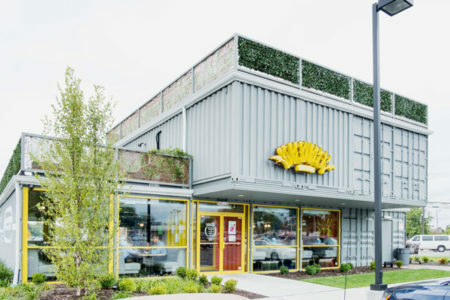 One of his latest projects allowed him to reuse eleven 40-foot shipping containers, stacked and cantilevered, to construct a 3,500-square-foot restaurant in Plainview, New York. The project was Simeonidis’s first opportunity to build a new building as opposed to retrofitting an existing space. He saw it as a way to push the definition of a sustainable environment while keeping to his sustainable philosophy. 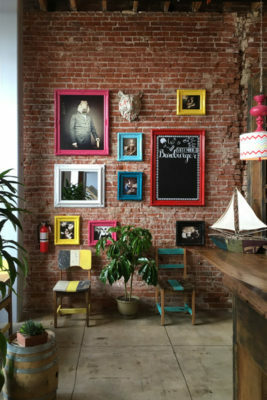 One of his latest tweaks is to the walls of Bareburger restaurants, which once featured reclaimed barn boards covering the walls from floor to ceiling. Simeonidis scaled that back, using the wood only as wainscoting and opting to cover the remaining portion of the wall with artwork. The passion Simeonidis has for constant change makes sense in the context of his career path. He graduated from St. John’s University with a pre-med degree. On the day he was set to take the Medical College Admission Test, he had an epiphany: he wasn’t interested in becoming a doctor. Instead, he got job as a New York City health inspector, which gave Simeonidis his first exposure to the restaurant industry. He inspected everything from five-star fine-dining restaurants to the seediest dives in the city, and everywhere he went, he enjoyed the hustle and bustle. 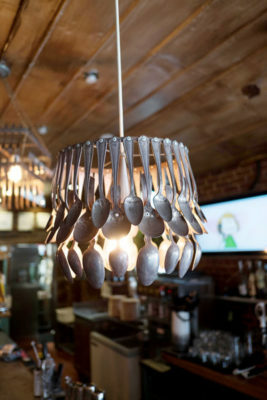 Simeonidis got the idea to use old flatware as chandeliers from utensils his great-grandfather left to the family. The natural assumption is that this is the point Simeonidis finally got into the restaurant business himself. In 1999, however, he got a job as an international tax specialist at KPMG LLP. “I knew it wasn’t for me from day one, but they said I was good at it and sent me to Hong Kong for a few months,” Simeonidis says. While in Hong Kong, Simeonidis got an e-mail from Pelekanos, who let his old friend know he was opening a bar in Brooklyn. When one of the business partners pulled out of the deal, Pelekanos asked if Simeonidis was interested. “I definitely was, so he told me to quit my job and come back to New York,” Simeonidis says. Artwork made by local artists ensures that no two locations have the same pieces. It took them about a year, but Pelekanos and Simeonidis opened their bar, Sputnik, in 2002. It was a live-music venue with a bar and kitchen, furnished with random chairs and tables the duo got cheaply off eBay. Their timing wasn’t great, but they made it work for seven years. In 2008, they finally realized neither they nor their bar could last much longer. From the very beginning of the business, which now includes 40 locations worldwide, Simeonidis said he knew the design of every location had to match the ethos of the food. Simeonidis has it all working together at Bareburger, although he’ll soon be tweaking the sustainable décor again.